Waardenburg syndrome (WS) is named after the Dutch ophthalmologist Petrus Johannes Waardenburg, who, in 1947, first described a patient with hearing loss, dystopia canthorum (ie, lateral displacement of the inner canthi of the eyes), and retinal pigmentary differences. In 1951, after identifying other patients with similar symptoms, Waardenburg defined the syndrome now classified as WS type 1 (WS1). Findings in WS1 include hearing loss, dystopia canthorum, and pigmentary abnormalities of the hair, skin, and eyes (see the images below). Marked facial asymmetry, lagophthalmos, drooping right corner of mouth. Image courtesy of Dourmishev LA et al, Cutis 1999; 63:139-40. Copyright 1999, Quadrant Healthcom, Inc.
Visage in profile demonstrates absence of nasofrontal angle, eyebrow hypertrichosis, upturned nasal tip, and shortened upper lip with pronounced cupid's bow. Image courtesy of Dourmishev LA et al, Cutis 1999; 63:139-40. Copyright 1999, Quadrant Healthcom, Inc. 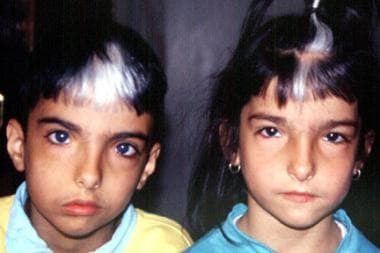 Brother and sister with Waardenburg syndrome. Image courtesy of Dourmishev LA et al, Cutis 1999; 63:139-40. Copyright 1999, Quadrant Healthcom, Inc. In 1971, Arias defined the phenotype of WS type 2 (WS2), which includes all of the WS1 features except dystopia canthorum. Both WS1 and WS2 are transmitted as autosomal dominant conditions with interfamilial and intrafamilial variability. Two far rarer variant forms of WS have also been identified. 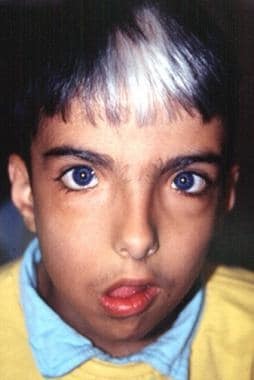 WS type 3 (WS3), or Klein-Waardenburg syndrome, includes features of WS in association with severe contractures. WS type 4 (WS4), or Waardenburg-Shah syndrome, has features of WS in association with Hirschsprung disease. WS4 is a heterogeneous disorder with either autosomal recessive or autosomal dominant inheritance. Evidence suggests that the MITF gene transactivates the tyrosinase gene, which is involved in melanocyte differentiation. PAX3 belongs to a family of paired-domain proteins that bind DNA and regulate gene expression; its molecular mechanism remains unclear. A study by Watanabe et al showed that PAX3 transactivates the MITF promoter. Therefore, mutations in the PAX3 gene could affect regulation of the MITF gene, leading to abnormalities of melanocyte differentiation. A recent work identified 15 novel and 4 previously published heterozygous mutations in PAX3 and MITF. Sequencing and copy number analysis of both PAX3 and MITF should be considered as part of the routine molecular diagnostic evaluation of these patients. Most, if not all, cases of WS1 are caused by mutations in the PAX3 gene located on chromosome band 2q35. Deletions, frame shifts, splice site, and nonsense mutations, as well as whole gene deletions, have been reported. WS1 may be inherited in an autosomal dominant pattern or may be the result of a de novo mutation. Two nonsense PAX3 mutations were identified in Chinese patients with WS1. One is heterozygous for a novel nonsense mutation, S209X, and the other is heterozygous for a previously reported mutation in the European population, R223X. Both mutations created stop codons leading to truncation of the PAX3 protein. Novel mutations of PAX3, MITF, and SOX10 genes have been described in Chinese patients with WS1 or WS2. Mutations in the MITF gene, located on chromosome band 3p14.1-p12.3, cause some cases of WS2. Deletions, missense, splice site, and nonsense mutations have been reported. These mutations may be inherited in an autosomal dominant pattern or may be de novo. Other cases of WS2 have been linked to another locus on 1p21-p13.3, still others remain unlinked to either locus. Mutations in PAX3 have also been found in patients with a WS3 phenotype. WS3 may be inherited as a dominant disorder. In some cases, WS3 may be a manifestation of homozygous mutations of this gene. Mutations in the genes PAX3 and MITF have been described in WS, which is clinically characterized by congenital hearing loss and pigmentation anomalies. Waardenburg PJ. A new syndrome combining developmental anomalies of the eyelids, eyebrows and nose root with pigmentary defects of the iris and head hair and with congenital deafness. Am J Hum Genet. 1951. 3:195-253. Arias S. Genetic heterogeneity in the Waardenburg syndrome. Birth Defects Orig Artic Ser. 1971 Mar. 07(4):87-101. [Medline]. Zaman A, Capper R, Baddoo W. Waardenburg syndrome: more common than you think!. Clin Otolaryngol. 2014 Sep 9. [Medline]. Pingault V, Ente D, Dastot-Le Moal F, Goossens M, Marlin S, Bondurand N. Review and update of mutations causing Waardenburg syndrome. Hum Mutat. 2010 Apr. 31(4):391-406. [Medline]. Watanabe A, Takeda K, Ploplis B, Tachibana M. Epistatic relationship between Waardenburg syndrome genes MITF and PAX3. Nat Genet. 1998 Mar. 18(3):283-6. [Medline]. Wildhardt G, Zirn B, Graul-Neumann LM, Wechtenbruch J, Suckfüll M, Buske A, et al. Spectrum of novel mutations found in Waardenburg syndrome types 1 and 2: implications for molecular genetic diagnostics. BMJ Open. 2013. 3(3):[Medline]. Yang SZ, Cao JY, Zhang RN, et al. Nonsense mutations in the PAX3 gene cause Waardenburg syndrome type I in two Chinese patients. Chin Med J (Engl). 2007 Jan 5. 120(1):46-9. [Medline]. Dutton K, Abbas L, Spencer J, et al. A zebrafish model for Waardenburg syndrome type IV reveals diverse roles for Sox10 in the otic vesicle. Dis Model Mech. 2009 Jan-Feb. 2(1-2):68-83. [Medline]. [Full Text]. Sangkhathat S, Chiengkriwate P, Kusafuka T, Patrapinyokul S, Fukuzawa M. Novel mutation of Endothelin-B receptor gene in Waardenburg-Hirschsprung disease. Pediatr Surg Int. 2005 Dec. 21(12):960-3. [Medline]. Fernandez RM, Nunez-Ramos R, Enguix-Riego MV, et al. Waardenburg syndrome type 4: report of two new cases caused by SOX10 mutations in Spain. Am J Med Genet A. 2014 Feb. 164A(2):542-7. [Medline]. Verheij JB, Sival DA, van der Hoeven JH, et al. Shah-Waardenburg syndrome and PCWH associated with SOX10 mutations: a case report and review of the literature. Eur J Paediatr Neurol. 2006 Jan. 10(1):11-7. [Medline]. Arimoto Y, Namba K, Nakano A, et al. 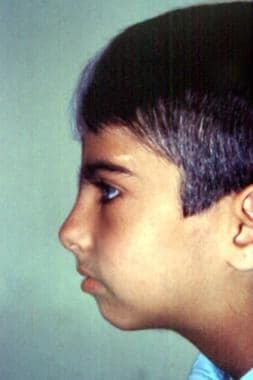 Chronic constipation recognized as a sign of a SOX10 mutation in a patient with Waardenburg syndrome. Gene. 2014 May 1. 540(2):258-62. [Medline]. Wu HT, Wainwright H, Beighton P. Tetraphocomelia with the Waardenburg syndrome and multiple malformations. Clin Dysmorphol. 2009 Apr. 18(2):112-5. [Medline]. Abouzeid H, Boisset G, Favez T, et al. Mutations in the SPARC-related modular calcium-binding protein 1 gene, SMOC1, cause waardenburg anophthalmia syndrome. Am J Hum Genet. 2011 Jan 7. 88(1):92-8. [Medline]. [Full Text].